Happy New Year! 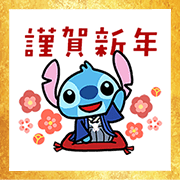 Stitch is all dressed up in his best New Year’s kimono and is ready with a variety of relaxed New Year’s greetings! They’re a great way to help friends and family celebrate the new year. Omikuji lasts from December 27, 2018 to January 3, 2019.